All stormwater from the City of Paso Robles is directed into one pipe which empties directly into Centennial Creek. This is the stretch of Centennial Creek that is surrounded by a great deal of impevious surfaces; commercial and residential areas. Pollutants in stormwater runoff and the rapid flow of water during storms have degraded the habitat in Centennial Creek. Native riparian vegetation is lacking because habitat conditions are not suitable for their overall survival. What has also contributed to the dearth of native plant species was a city effort to remove plant life in order to help put more eyes on the creek. Unfortunately this has had a negative impact on the creek ecosystem. Centennial Creek had been on the city’s lists of restoration needs for years and in 2014 they found out about an opportunity through the National Fish and Wildlife Foundation’s (NFWF) Five Star and Urban Waters program. This is a program supported in part by the Environmental Protection Agency. Upon learning of this opportunity, the City of Paso Robles approached the Upper Salinas-Las Tablas Resource Conservation District (US-LTRCD) about the possibility of leading a restoration project along a section of Centennial Creek. The City of Paso Robles supported US-LTRCD with applying for a Five Star and Urban Waters Restoration grant from the National Fish and Wildlife Foundation (NFWF) for the purpose of addressing the condition of Centennial Creek; specifically flooding, and overall watershed management issues. This funding is made possible through a partnership between NFWF and EPA, among other organizations. In 2014 US-LTRCD received $30,000 from NFWF for the Centennial Creek Restoration Project. 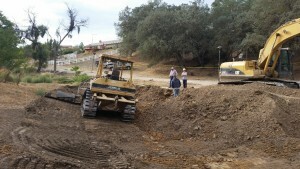 Heavy Equipment doing initial grading. Photo: Upper Salinas-Las Tablas Resource Conservation District. Photo: Upper Salinas-Las Tablas Resource Conservation District. To be most effective at addressing these issues, US-LTRCD chose a stretch of creek that interfaces with urban infrastructure. They wanted to treat the cause and not just the symptom so it made the most sense to start upstream as opposed to downstream where more enhancements would be needed and where there would be a bigger battle. Over the last year some critical milestones have been reached including a significant amount of earth work and site preparation. When the project is complete, almost one acre of habitat will have been restored. This past October and into November is when implementation of creek improvements began. This included hydro-mulching, site rehab, planting, and erosion control. There will be a bit of a break over the winter and then work will pick up again next spring. Over the spring there will be additional planting efforts. Taking this break will allow more time to source the right type of plants and will allow US-LTRCD to create and advertise opportunities for community involvement. One opportunity for engaging with the surrounding community is the paved bicycle pedestrian path that runs parallel to the creek. The path is used regularly by neighboring residents which has made for positive interactions between residents and the US-LTRCD. Residents can see the improvements as they are happening and they have the opportunity to ask questions about the project and whether or not other areas of the creek will receive similar attention in the future. This is exciting for the conservation district because it helps them engage with residents about Centennial Creek and talk to people about the fact that, while Centennial Creek in this location is open and visible, it is in a culvert and has been paved over throughout most of the city. This conversation helps connect people to the creek and helps the public understand that Centennial Creek it is part of a larger watershed. Upper Salinas Las Tablas Resource Conservation District is beginning to form a public engagement strategy for next spring. They intend to engage residents who are using the bicycle / pedestrian path in volunteer projects next spring. They are still conceptualizing what the volunteer projects will look like and hope to involve organizations such as the Boy Scouts, FFA, and 4H. In the meantime, installation of informational signage about the Centennial Creek Restoration Project will take place. For the Upper Salinas Las Tablas Resource Conservation District it was critical to establish a good line of communication between engineers, project managers, and construction crew. Mistakes can be avoided if all parties involved feel comfortable with and are willing to make a quick phone call in order to get clarification about construction. They also found a great deal of benefit in pulling in a mentor / local expert who was willing to lend their knowledge to help onsite and help with follow through. People depend on soil, water, air, plants, and animals to survive. The Upper Salinas-Las Tablas Resource Conservation District (US-LT RCD) provides technical assistance, education and resources to help agricultural, rural and urban communities preserve these natural elements while supporting robust land productivity.